The Rotary Jaw Flow Wrappers use rotating end seal jaws that enables the Flow Wrappers to produce high speeds. Available in single, twin, triple and quad jaw configurations. The Rotary Jaw Flow Wrappers range from entry level hand fed machines right through to complete automatic lines. The Box Motion Flow Wrappers use true Box Motion on the end seal jaws providing longer sealing times. Due to the additional dwell time they can seal thicker wrapping materials, giving the product a higher quality seal. They are better suited for taller products, heavy products and for modified atmosphere packaging (MAP), as they can provide airtight seals. The Back Seal Flow Wrappers are designed to have the film fed from a reel at the bottom/underside of the machine. This eliminates the need to use trays for loose products. Ideal for fragile, irregular or heavy products that need to be carried by the film. 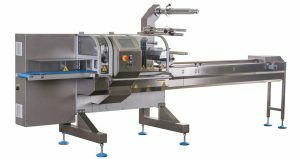 Flow Wrapping machines can also be supplied with various options to suit specific packaging applications. The PA-450-S3 Flow Wrapper represents tremendous value in being a 3 axis fully electronic, servo driven machine. This machine eliminates costly film wastage, is simple to clean and has an easy operational interface. With it’s cantilever designed construction, the PA-450-S3 allows for easy access, maintenance and safety. This Flow Wrapper is designed for quick and easy product changeovers. The PA-500-S3 Flow Wrapper represents tremendous value in being a 3 axis fully electronic, servo driven machine, that is versatile and can handle a large range of product dimensions. This machine eliminates costly film wastage, is simple to clean and has an easy operational interface. With it’s cantilever designed construction, the PA-500-S3 allows for easy access, maintenance and safety as well quick and easy product changeovers. Our PA-600-S3 Flow Wrapper is a sturdy and reliable machine and larger than our PA-500-S3 and our PA-450-S3. This 3 axis, fully electronic, servo driven machine allows you pack larger products. The PA-600-S3 Flow Wrapper features a cantilevered frame for easy access, cleaning and maintenance. 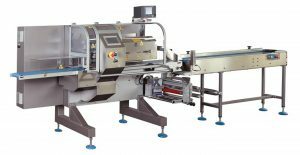 The PA-700-S3-BR Backseal Flow Wrapper is a sturdy and reliable machine that eliminates the need for tray sealing of loose products. 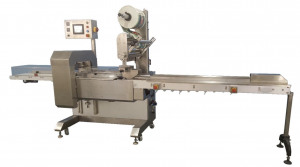 The PA-700-S3-BR Backseal Flow Wrapper is a 3 axis, fully electronic, servo driven machine that is easy to operate and reduces costly film wastage. This machine has a cantilevered frame for easy access, cleaning and maintenance. The PA-700-3-BB Flow Wrappers are designed for backsealing multiple applications in the packaging industry. In addition to packaging long-life products by flushing gas or spraying on preserving aromas, the PA-700-S3-BB Flow Wrappers are specifically indicated for large, high or in-chain products using polyethylene or polyolefine film. The PA-700-S3-BB Flow Wrappers are a result of years of design experience on modified atmosphere packaging machines, creating a very fast, versatile machine for perfectly airtight packaging applications. The PA-700-S5-BBM Flow Wrapper allows for packaging if fragile, irregular and heavy products, which need to be carried by the packaging material. With the use of the motors and linear actuators, the transverse sealing unit produces high quality packaging. 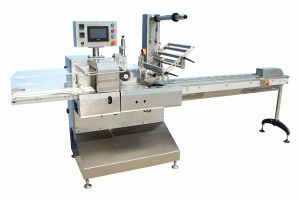 The PA-700-S5-BBM Flow Wrapper uses 5 servo motors for precise accuracy and is controlled via a user-friendly touchscreen interface and has a cantilevered frame for easy cleaning.